For tournament fishermen and serious anglers there’s no better fishing system than the 997c Combo. With a new monster color display, Hummingbird’s exclusive High-Definition Side Imaging Sonar delivers super-sharp picture-like images of the bottom. 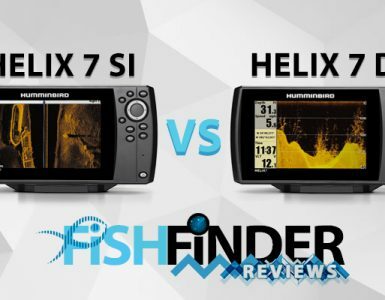 With an incredibly wide reach (480 feet from side to side of your boat) it will change your understanding of the bottom structure, and change the way you fish. With the ultra-wide display, you can easily view Side Imaging and the built-in, down looking DualBeam Plus sonar or other screens simultaneously. Record and playback sonar reading, and even make sensitivity and other adjustments to the recording. You get the best in navigation too, with the 16 channel GPS/WAAS receiver and preloaded HotMaps Premium and Navionics Gold Cartography, if you choose. Or choose Navionics Platinum cartography for 3D mapping, satellite overlays, aerial photography of ports, and much more. The 997c SI Combo’s capabilities can be expand even further with Humminbird Fishing System Modules. The power, the picture and the performance of the 997c SI Combo make it the ultimate Fishing System! 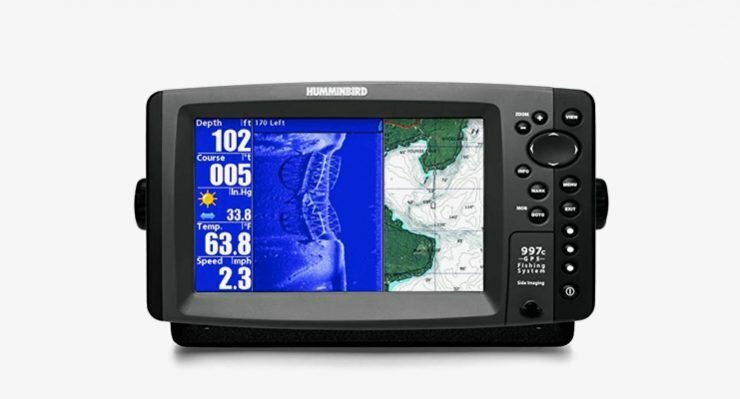 The Hummingbird 997c SI Combo NVB Color Fish Finder and GPS Chartplotter, pre-loaded with Navionics Gold and Hotmaps is for serious recreational anglers looking for the best. The 997c packs tons of functionality, lets you add advanced accessories, includes GPS chartplotter, and will revolutionize the way you fish. The 997c SI Combo uses revolutionary 800 kHz side-imaging sonar with 180-degree coverage to 360 feet to either side and 150 feet down, as well as DualBeam PLUS sonar with 20- and 60-degree beams for both wider coverage and better bottom definition down to 1,500 feet. This unit includes accelerated real-time sonar and echo enhancement technology for the instant capture of action and the sensitivity to track a jig to over 70 feet, with a target separation of 2.5 inches. The 997c also has an external, 16-channel WAAS/EGNOS GPS receiver, and a built-in UniMap of USA inland lakes, rivers, and coastal areas. 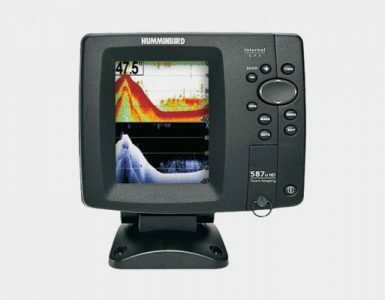 This Humminbird unit’s high-speed, micro-dynamic transducer is reliable to 70 mph, and includes water temperature and GPS speed. The 997c has a brilliant 8-inch TFT LCD screen with 480 x 800 lines of resolution in full color for enhanced separation, and an adjustable backlight. This unit features dual microprocessors and a graphics co-processor for fast, smooth operation, networking capability, and chart recording to SD card with on-screen playback. The 997c SI Combo NVB (Navionics Value Bundle) also features programmable view presets, dual memory card expansion slots, plug-and-play compatibility with tons of upgrade accessories, and comes pre-loaded with Navionics Gold and HotMaps yet remains easy to operate. The 997c includes a one-touch multi-level zoom, programmable view presets, and X-Press Menus for quickly accessing important controls. This fish finder features both fresh and saltwater options, instant update to immediately show setting changes, full screen and 3D chartplotter, and Freeze Frame to pause the display, as well as a man-overboard function to track back to that most important of spots. The 997c comes with a transom mount transducer, and a tilt-and-swivel, quick-disconnect mount system, for Gimbal or in-dash mounting. This unit measures 11.25 x 6.75 x 4.25 inches (W x H x D) as a Gimbal mount, or when in-dash mounted requires three inches of clearance. For upgrades, this system is compatible with multiple other transducers for more powerful performance. The Humminbird 997c SI Combo is fully gasketed and waterproof so it floats, and is backed by a manufacturer’s one-year warranty. 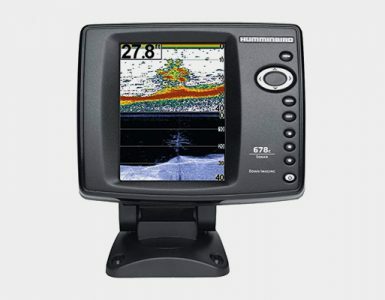 Hummingbird 997c SI Combo Fishfinder and GPS Chartplotter, transducer with connecting cable, mounting hardware, user’s manual and warranty information.